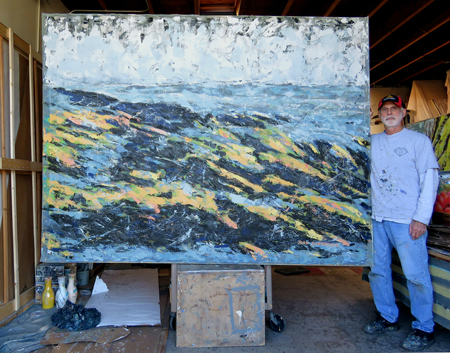 John Robertson is a self-taught, primitive, impressionistic painter, whose paintings are much more than a visual, realistic copy of the subject. Full of movement and depth, the works are created with a variety of techniques, using cement trowels, brushes, wood scrapers, cans and plastic cups to apply acrylic paint to canvas. The paintings are then hung without a structure, similar to a tapestry. John says, I don’t feel a desire or need to reproduce a subject exactly as it may look to a casual viewer. I want to create a colorful interpretation of the subject, something that will draw the viewer deeper into the painting. John is renowned for his paintings of athletic figures for major sports arenas across the US, most recently for the Atlanta Braves stadium and the Green Bay Packers Lambeau Field. In addition to an impressive list of commercial projects, including movies and television, he also creates images for private clients. Robertson’s documentation was sponsored by Richard & Yvette Franklin. The AfterGlow was hosted by Christine & Kevin Beirne. The FOTM archive has extensive infomation about this artist.